Event will feature a great variety of brews and hard ciders, plus a truly unique Gettysburg experience not to be missed! GETTYSBURG, PA (November 6, 2013) – the Gettysburg Festival, Inc., is making plans for its inaugural Gettysburg Brew Fest, Saturday, August 23rd on the historic grounds of the Lutheran Theological Seminary at Gettysburg. Featuring an impressive array of local, regional, Pennsylvania and national brewers, the Gettysburg Brew Fest is a fundraiser for non-profit Gettysburg Festival, Inc. The new event was approved unanimously by the Gettysburg Festival Inc. monthly board meeting on Monday, November 4th. “This event is already proving to be one of the most highly anticipated events in the Gettysburg area” said Gettysburg Festival, Inc. Executive Director, Randy Prasse. “Just while soliciting feedback from locals businesses and residents over the past six months, it is clear to me that there is a high level of interest and strong demand from beer-enthusiasts throughout the region for an upscale brew festival in Gettysburg. With spectacular views of the Gettysburg Battlefield and South Mountains, set against the backdrop of the newly opened Seminary Ridge Museum- arguably one of most historic and recognizable structures in Gettysburg- the event will deliver a distinctive sampling experience. Initially offering one afternoon session-from 4:30pm to 8:00pm-the Gettysburg Brew Fest will not only offer an impressive array of brews and hard ciders from the immediate region and throughout Pennsylvania- but from around the U.S. as well. According to Prasse, “We are launching this event as a one-day, single-session experience-but depending on market interest and demand, we will certainly consider expanding it”. Prasse, with 25 years of festival management successes of his own, is partnering with BrewFest Partners, based in Racine, Wisconsin. BrewFest Partners brings over 25 years of festival management experience, including over 10 developing and managing brew festivals in Wisconsin, Illinois and Indiana. $45 advanced and $55 private-session VIP tickets will go on-sale in April through the Gettysburg Festival, Inc. website and will be limited to 1,000 attendees to ensure a great experience will be had by all who attend. The Gingerbread Celebration will be accepting entries in the following categories: Families/school-aged children, amateur/home bakers and professional chefs. Area businesses are also welcome to gather co-workers together to submit an entry to win the soon-to-be highly-coveted traveling “Ginger Trophy” in the Business Challenge category. According to Prasse, “One aspect of this event that I am most excited about— because it involves local businesses and further engages them with the community’s Holiday celebration— is the newly introduced Business Challenge. It encourages employees of area businesses to team up to share Holiday cheer with their co-workers and do something the entire community can share in.” If the thought of designing a gingerbread house is too daunting, there is also an option to design a Gingerbread Man/Woman. Entry form submissions are being accepted through November 22nd. An announcement of prizes for each category will be forthcoming. Winners will be determined by “People’s Choice” votes submitted throughout the event. While the Gingerbread Celebration is free, there will be a ticketed reception on Friday, December 6 from 5:00-7:00pm, featuring culinary samplings from top area chefs and a live auction of the Gingerbread Houses. Tickets are $20 for individuals or $35 per couple, with proceeds going to non-profit Gettysburg Festival and Survivors, Inc. “We partnered with Survivor’s Inc. this year because, while domestic violence is a terrible environment to live in any time, the Holidays are an especially difficult time for families faced with it,” Prasse said. “Our collaboration with Survivor’s Inc. allows us to both produce a fun, family event for those who attend and make a lasting impact in the community where it truly matters— at the individual family level.” For more information about the Gettysburg Festival, Inc.’s Gingerbread Celebration or to download entry submission and vendor applications, please visit http://www.GettysburgFestival.org. GETTYSBURG, PA (August 7, 2013) – On the heels of a successful 2013 event, the Gettysburg Festival – the parent organization of the yearly Gettysburg Fest – has set wheels in motion for an even better 2014. The 7th Annual Gettysburg Fest will be held June 11-15th and debut its newly condensed 5-day format, featuring multiple stages to showcase a wider variety of regional and local talent, while still offering national level talent. Festival organizers commit to remaining true to the theme of celebrating music, arts and culture. The Fest will also build on its tradition of involving the entire community through its Fringe events and popular visual arts and culinary features, such as the Plein Air paint outs, Quick Draw competition and the History Meets the Arts: Edible Arts Tour. Additionally, the Fest has slated Father’s Day weekend in Gettysburg, PA as the place to be, inviting families to bring Dad for a truly memorable experience he will always cherish – having already secured dates for 2015 (June 18-21) and 2016 (June 16-19). A partnership announcement for the venue for the newly revamped Festival will be forthcoming. Video highlights from the 2013 Festival and information updates about Gettysburg Fest 2014 can be found on the website at www.GettysburgFestival.org. The social media community can be found online at www.twitter.com/gettysburgfest and www.facebook.com/TheGettysburgFestival. GETTYSBURG, PA (June 6, 2013) – The cross roads of history and culture come together this weekend for the 6th Annual Gettysburg Festival, held June 7-16th throughout downtown Gettysburg. Offering more than 75 events – all celebrating American arts, culture and cuisine – the majority are free and open to the public and showcase talents on a local and national level. The full listing of events, as well as descriptions and links to purchase tickets can be found online at www.GettysburgFestival.org. 1. 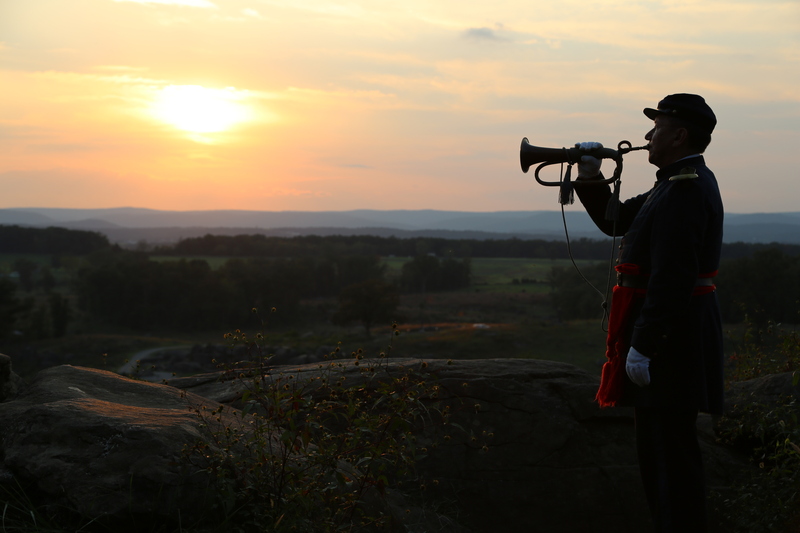 The Gettysburg Brass Band Festival combines the excellence of brass concerts with a picturesque location. The event takes place at the beautiful campus of the Gettysburg Lutheran Theological Seminary. Musical performances spotlight some of the best brass groups from the mid-Atlantic region, including Rockfield Brass, Benfield Brass, Spires Brass, Federal City Brass, Chesapeake Brass, 11 Infantry Fife & Drum, Maryland Defense Force Band and closing out with a Taps tribute performed by renown bugler, Jari Villanueva. Event Details: Saturday, June 8 the Lutheran Theological Seminary. Free, but ticket required. Bring your own chair. 2. Blues music and BBQ… an all-American combo! One of the Festival’s most popular events, Blues, Beer & BBQ will feature the U.S. Army Field Band Volunteers, legendary bluesman Big Jack Johnson’s backing band, the Cornlickers and PA’s First Lady of Blues, Octavia. Event Details: Saturday, June 8 at 9:00pm @ Gettysburg College, Memorial Field. Tickets are $40 including the BBQ (4-7pm) and $10 for concert ticket only. 3. Striving to be an event for the entire family, Gettysburg Festival plays host to a great children’s program. This year’s Children’s Art Fair will pay tribute to the agricultural heritage of Adams County with a program designed as a world market of creative ideas, with a focus on healthy living. Children will do various fun activities and leave with several unique take-home pieces of their very own, from lettuce plugs to plant to one of a kind craft items they’ve made themselves. The afternoon will be rounded out by performances from the Gettysburg Community Theater and storyteller, Ann Griffith. 12:00-5:00pm @ Gettysburg College Penn Hall lawn. Free and open to the public. 4. Hailing from Columbus, Ohio, Phil Dirt Presents: Surfs Up! A Tribute to the Beach Boys has been together for 20 years and gained a reputation as the nation’s hottest beach party band. Performing hits from The Beach Boys, Jan and Dean, The Hondells, Ronny and The Daytonas, and others will have the crowd on its feet, dancing and singing along. Bring the whole family and join the beach party on Memorial Field! Come decked out in your finest beach party attire. The best dressed beach bum will win a Pendleton board shirt in Beach Boys plaid, donated by Pendleton Woolen Mills at the Gettysburg Outlets! Sunday, June 9 for provided seats or $10 if you bring your own chair. 6. Attendees will depart History Meets the Arts: Edible Art Tour satiated and inspired after visiting five galleries throughout Gettysburg’s historic district, meeting world class artists and local top-tier chefs and enjoying both artistic and culinary masterpieces. Guests will have the first chance to view the 2013 History Meets the Arts galleries, meet the artists and enjoy culinary masterpieces at every stop. Gallery locations are: Adams County Arts Council, Gettysburg Frame Shop, King James Gallery, Lord Nelson’s Gallery and Lord Nelson’s Satellite Gallery at the Gettysburg Fire Hall. Participating restaurants include: Blue Parrot Bistro, Garryowen Irish Pub, Gettysburg Hotel, Inn at Herr Ridge, Wyndam Gettysburg and Fairfield Inn 1757. Gettysburg College Memorial Field. Tickets are $25. 8. Widely regarded as America’s most popular and respected author of military fiction, master storyteller Jeff Shaara captivates audiences by bringing America’s vivid past to life in stories that span from the American Revolution to World War II. Son of Pulitzer prize-winning author, Michael Shaara (The Killer Angels), Jeff wrote a prequel (Gods and Generals, 1996) and a sequel (The Last Full Measure, 1998) to his father’s classic work, followed by the creation of ten additional historical novels, every one a New York Times Bestseller. Shaara is a renown speaker and will be bringing his lecture, “History through Storytelling, Jeff Shaara’s Journey Through the Legacy of his Father” to the Gettysburg Festival audience. 11:30am @Adams County Ag & Natural Resource Center. Tickets for this lecture and luncheon are $40. 9. One of popular music’s most romantic singing groups, The Lettermen are bringing their close-harmony pop songs to the Majestic Theater stage for Gettysburg Festival 2013! In a career spanning over 50 years, the talented trio has given us iconic songs like “When I Fall in Love,” “The Way You Look Tonight,” “Sealed with a Kiss” and “Unchained Melody,” and is sure to be a crowd-pleasing favorite feature of the Festival. Come fall in love… Again! Event details: Saturday, June 15 are $52.50, $42.50 & $32.50 and can be purchased through the theater at 717.337.8200 or online at www.GettysburgMajestic.org. 10. Gettysburg Festival, in conjunction with Boritt Films and the Majestic Theater, is pleased to host the world premiere of “The Gettysburg Story.” Dramatically telling the history of the greatest battle fought in the Western Hemisphere, “The Gettysburg Story” was written, produced and directed by Gettysburg native, Jake Boritt and is narrated by actor, Stephen Lang (Avatar, Gettysburg). Using cutting edge technologies – including high definition radio control aerial drone cinematography, motion control timelapse footage, dynamic digital geo-location graphic maps – and being granted unprecedented access to the 6,000-acre battlefield, “The Gettysburg Story” captures the unique and timeless piece of American history, telling it in a new way. Event details: Sunday, June 16 at 3:00pm at the Majestic Theater. Tickets are $10 and can be purchased through the theater at 717.337.8200 or online at www.GettysburgMajestic.org. *All events, prices, personalities, venues, dates and times subject to change without notice. Highlights For This Year’s Event Include “History of Taps” Seminar with Jari Villaneuva, Federal City Brass Band, PA Volunteer Infantry Fife and Drum, Maryland Defense Force, and More! GETTYSBURG, PA (April 19, 2013) – Gettysburg Festival is pleased to present another stellar line-up for the Brass Band Festival during its annual 10-day celebration of the arts. Always a much-loved portion of the Festival, this year’s Brass Band event, held June 7 and 8 throughout downtown Gettysburg, will feature a seminar on the “History of Taps” with expert, Jari Villaneuva, Federal City Brass Band, 11th PA Volunteer Infantry Fife and Drum, Maryland Defense Force, the Wildcat Regiment Band, and more. While the Brass Band Festival is free, tickets are required to attend and can be obtained online at http://www.gettysburgfestival.org. Donations will be welcomed at the event to help cover costs of this free event. All who donate will receive a special commemorative button. calls used in both camp and battle, with calls being played on an original Civil War bugle. The event will be bookended on Saturday, June 8th with a “Taps” performance at the Cupola of Schmucker Hall at Lutheran Seminary as the closing ceremony of the Brass Band Festival. Other performances throughout the weekend include Market Street Brass, Gettysburg Brass and the Federal City Brass Band on Friday evening at Lincoln Square and the Dobbin House patio and the Brass Band Festival on Saturday, featuring the Rockville Brass Band, Benfield Brass Band, Spires Brass Band and Chesapeake Brass Band. Saturday evening will bring performances from 11th PA Volunteer Infantry Fife and Drum and the Maryland Defense Force Band. “The Brass Band Festival is an important part of Gettysburg Festival as a whole for us,” explains Festival Executive Director, Randy Prasse. “This is a celebration of Gettysburg’s rich history and we are proud to welcome Jari Villaneuva, as well as all the bands and participants. We are also pleased to partner with Steinwehr Avenue Business Improvement District to provide Friday night’s performance at the Dobbin House and at the American Civil War Wax Museum on Saturday.” Additionally, many of Saturday’s performances will be held at the Hill-Unger Pavillion at the Lutheran Theological Seminary. For the full schedule of the two-day Brass Band Festival, including times and locations, please visit http://www.gettysburgfestival.org. The celebration of Brass continues the following weekend with a performance from the Wildcat Regiment, in service as the Regiment Band of the 105th Pennsylvania Volunteer Infantry, on Saturday, June 15th at 2:00pm at the National Park Service Museum and Visitor Center and at 6:00pm for an evening concert at the Pennsylvania Memorial on the Battlefield. This modern re-creation of the Civil War band utilizes original instruments and reproduction hand-made uniforms. Celebrating its sixth year, the Gettysburg Festival (a 16-time IFEA Pinnacle Award winner) is a sought out event, which has grown to become a yearly tradition for the entire family with both area residents and tourists alike. With an average attendance of 23,000 people from 30 states and the District of Columbia, the Festival celebrates local talent within the community through its Fringe events in the areas of visual arts, culinary arts, theater, film, music and children’s events, as well as presenting world-renown experts in these categories. Past highlights include James Earl Jones narrating A Lincoln Portrait, comedy legend Bob Newhart, Kevin Eubanks of Tonight Show fame, former White House Chef Walter Scheib and the critically-acclaimed Boston Brass, to name a few. Ideally situated in historical central Pennsylvania and located within a day’s drive of 60% of the entire North American population, Gettysburg Festival 2013 will be held June 8-16th. The Gettysburg Festival is a non-profit 501(c)(3) organization. Highlight performances and activities for the 2013 Gettysburg Festival include: CMA’s “New Artist of the Year,” Hunter Hayes; iconic romantic trio, The Lettermen; New York Times best-selling author, Jeff Shaara; Phil Dirt presents: Surfs Up! A Tribute to the Beach Boys; and perennial favorites, Blues, Beer & BBQ; History Meets the Arts Edible Art Tour; and the Children’s Festival. For more information about the Gettysburg Festival, the 2013 line-up or tickets to various events, please visit our website at http://www.gettysburgfestival.org. Up-to-the-minute details can be found on Twitter (http://twitter.com/gettysburgfest ) and Facebook (https://www.facebook.com/TheGettysburgFestival ). The Gettysburg Festival is pleased to welcome our new Executive Director, Randy Prasse. He stepped into his new role on Monday, March 18 and has hit the ground running in preparation for the 2013 Festival. Prasse’s tenure with the Wisconsin State Fair – the state’s largest event – saw the event go from a $3.7 million deficit in 2005 to consecutive $1.5 million surpluses in 2007 and 2008, with increased multi-year corporate sponsorships and higher attendance. Additionally, Prasse has been active in industry leadership, including serving on the President’s Council of the International Festival and Events Association (IFEA) and filling the role of President of IFEA’s local Wisconsin chapter. Most recently, he served as the Director of Destination Marketing for Discover Mediaworks in Madison, Wisconsin and Executive Director of the Fox Cities Convention and Visitors Bureau, representing over a dozen communities in northeastern Wisconsin. Hailing from Freeport, Illinois, Prasse was raised on a dairy farm that has been in his family for six generations, dating back to 1873. He and his wife, Susan, have three daughters and are in the process of relocating to Gettysburg. A long-time Harley-Davidson owner, Prasse is anxious to explore south central Pennsylvania on his motorcycle. The Gettysburg Festival is proud to announce the winner of the “Then Sings My Soul: Songs & Spirituals from the American Experience” giveaway. Congratulations! Look for an email from the Gettysburg Festival with details of how to claim your prize. As the fifth annual Festival comes to a close this weekend, we thank all of our guests and visitors, performers and artists, donors and volunteers, board members and staff for their unflagging support. We couldn’t have such a wonderful Festival without you! Bring a Friend to the Festival Finale – for FREE! To celebrate the conclusion of the fifth annual festival, the Gettysburg Festival is giving away FIVE (5) buy-one-get-one tickets free to the “Then Sings My Soul: Songs & Spirituals from the American Experience” performance. To enter to win a free ticket, write a comment here describing why you want to attend Then Sings My Soul before 9:00 am on Friday, June 15, 2012. At that time, an online random number generator will be used to select five commenters as winners. Each winner will be entitled to a free ticket of the same value of a new ticket purchased to the concert. Tickets are available at all price levels. Return tomorrow to learn if you’re a winner! The Gettysburg Festival is proud to announce the winner of the Red Molly giveaway. Come back tomorrow for another ticket giveaway! Go Red with a Friend – for FREE! In celebration of the kickoff of the fifth annual festival, the Gettysburg Festival is giving away FIVE (5) buy-one-get-one free tickets to the Red Molly concert. This New York-based trio is quickly gaining an ever-growing and devoted fanbase of “redheads” for their authentic Americana, folk, bluegrass-influenced songs. Their performances feature gorgeous a cappella ballads, bluegrass-tinged folk and a touch of jazzy western swing, all done up in their trademark three-part harmonies, signature dobro licks and inventive arrangements. To enter to win a free ticket, write a comment here describing why you want to attend the Red Molly concert before 9:00 am on Wednesday, June 13, 2012. At that time, an online random number generator will be used to select five commenters as winners. Each winner will be entitled to a free ticket of the same value of a ticket purchased to the concert. Tickets are available at all price levels.